The event was held at the Chinese Restaurant Bamboo 2000, with 47 models (26 females and 21 males), showcasing fabulous collections by local fashion designers.The much awaited auditions for Kigali Fashion Week kicked off last weekend with local fashion designers showcasing a variety of their collections. During the auditions, seven renowned local designers were selected to present their creative designs and runway flair during the Kigali Fashion Week slated for December 5. These include the Marion Kigali, Itelier Ikaze designers and Francis Zahabu designers. "We want to get the best attire that our models will wear for the international designers and the general public during the Kigali fashion week that starts on 5 next month," said John Bunyeshuli, the Chief Executive Officer of Kigali Fashion Week. The show is also expected to attract top fashion designers from Kenya, Ethiopia, Burkina Faso, Demark, France and South Africa. 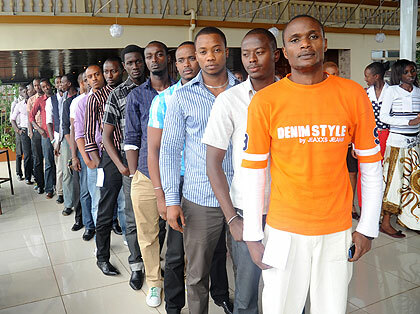 The three-day fashion show will help to raise funds to construct the first fashion school in Rwanda. Besides showcasing their collections, Bunyeshuli said Rwandan fashion designers will have the opportunity to learn latest skills and creative techniques in artwork from seasoned foreign designers. "This is an opportunity for us [designers] to develop the talent of many other young people in the fashion industry," said Colombe Ituze Ndutiye.